Katherine Broderick and Eleazar Rodriguez. Photo by Mike Hoban. They do things differently in Spain: when a man stalks a woman he barely knows from one city to another and, with the aid of a local beardtrimmer, infiltrates her home uninvited using a number of different disguises, one would at the very least expect this to result in a restraining order or (more likely) something possibly a little extrajudicial rather than a jaunty love story. This premise is the basis of The Barber Of Seville, Giacomo Rossini’s most famous comic opera. Jonathan Miller’s timeless version returns for the 12th time to English National Opera, this time under the direction of Peter Relton. With the sole exception of Morgan Pearse as the eponymous barber, the cast does a highly commendable job of exploring Rossini’s hilarious creation in all its incredible twists and turns. Pearse is a bland choice here and makes little impact despite his central role. What humour he brings to the stage is largely down to Relton’s direction and Rossini’s quips. Artistically, he is but a pale shadow of Uruguyan bass Erwin Schott’s Figaro in this opera’s sequel over at the ROH. The acting of Mexican tenor Eleazar Rodriguez as the pursuing Count Almaviva is almost suffocated by the lax early direction but he comes beautifully into his own about a third into the production. Liverpool-born mezzo-soprano Kathryn Rudge is the perfect foil as Rosina, the Count’s intended, with her superb portrayal of a woman with her own agenda. Barnaby Rea wears a ludicrously large hat but still oozes malevolence as Don Basilio, the scheming counterpart to Figaro. The plaudits, though, belong to the highly experienced Andrew Shore as Dr Bartolo, Rosina’s guardian and would-be husband, and Katherine Broderick as Berta his housemaid. The latter has only a supporting role but she brings sunshine whenever she sings. Shore has played Bartolo a number of times yet there is no staleness here; his excellent comic timing, punchy acting and masterful grip on the arias leaves all in his wake. American conductor Christopher Allen makes his ENO debut and, while Barber Of Seville doesn’t have the most challenging score, keeps the pace lively and fun. The stage design is as perfunctory as would expect for an opera which was originally written as a cheap filler. Relton, though, makes hard work of what is one of opera’s most entertaining outings. The first third is incredibly static and watching two men quibbling in the centre of one of London’s grandest stages for what seems forever and a day is never going to be the highlight of anyone’s evening. Some scenes are more than a mite leaden-footed and there’s a feeling that this young cast could have been pushed into a more energetic expression of Rossini’s magnum opus. Relton’s work ultimately turns this Barber into something of a black sheep of Miller revivals. 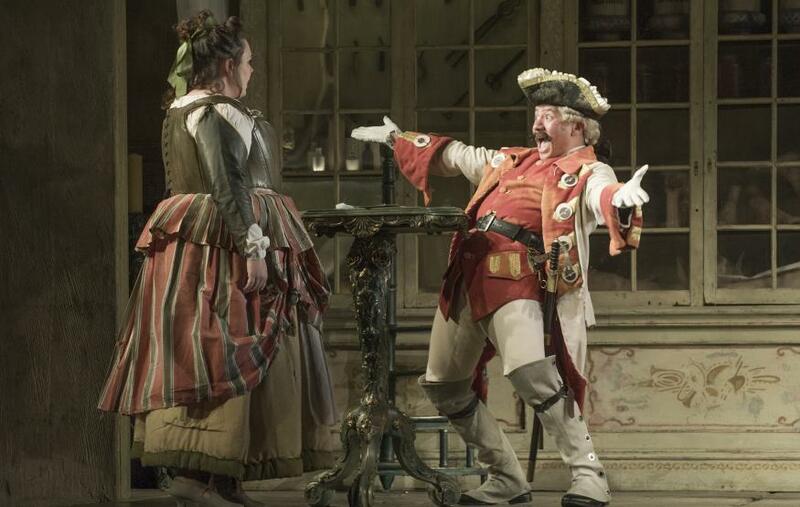 The Barber of Seville continues at the English National Opera, London Coliseum, St Martin's Lane WC2N 4ES, until 11 November 2015. Tickets £12-£125. Londonist saw this production on a complimentary ticket.